The latest version available is Tor Browser Bundle 4.5, which has been recently released, coming with important changes, including improved usability, bringing a wrapper for launching Tor from the File Manager, the Desktop, the Apps Menu or the command-line, a simplified Tor menu has been implemented, security and privacy enhancements have been implemented and the defaut search provider has been changed to Disconnect (which provides private Google search results). 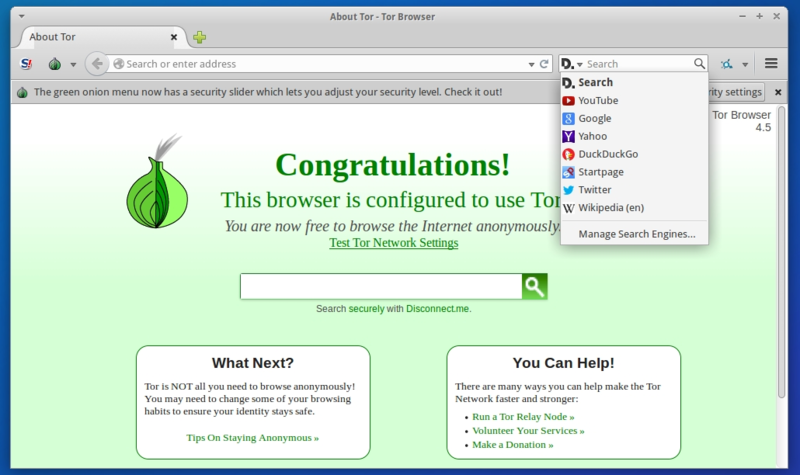 In this article I will show you how to install Tor Browser 4.5 on Ubuntu 15.04 Vivid Vervet, Ubuntu 14.10 Utopic Unicorn, Ubuntu 14.04 Trusty Tahr, Ubuntu 12.04 Precise Pangolin, Linux Mint 17.1 Rebecca, Linux Mint 17 Qiana, Linux Mint 13 Maya, Pinguy OS 14.04, Elementary OS 0.3 Freya, Deepin 2014, Peppermint Five, LXLE 14.04, Linux Lite 2 and other Ubuntu derivative systems. Tor browser doesn’t launch after update. Uninstalled and then reinstalled but still won’t work. But then they do not provide clear instructions for Vivid.